Launched during Berkeley Says No to Torture Week, October 10-16, 2010, this coalition includes members of several local, regional and national organizations who oppose the use of torture and who demand that Guantánamo Bay prison be closed with justice. See story and videos from one of the week's forums here. Read the group's resolution here. Because of the efforts of Berkeley No More Guantanamos and the Berkeley Peace and Justice Commission, the Berkeley City Council passed a Resolution to close Guantanamo and welcome cleared Gitmo detainees to settle in Berkeley at private expense. One of the detainees, Djamel Ameziane, was actually released in 2014. Thank you for lobbying President Obama and Congress to release Djamel and the other detainees who have been cleared for release but who are still being held at Guantanamo. And help the Berkeley group bring Chef Djamel Ameziane from Guantanamo to live in Berkeley! 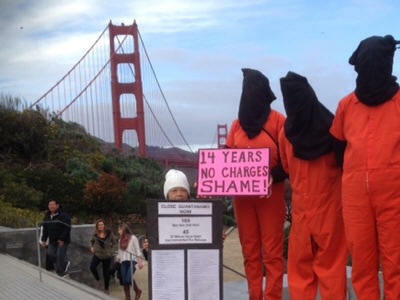 Codepink Brings Gitmo Detainees to the Golden Gate Bridge 14 YEARS of Injustice! CLOSE GUANTANAMO NOW! Codepink had a very successful peace march on the bridge on January 10, 2016, in solidarity with detainees of Guantanamo prison, most still being held without charges, even though many have been cleared for release years ago. We read the words of one of the detainees, Tariq Ba Odah, who has been on a hunger strike since 2005, and is still force fed 2x per day.